See below where MAEF programs are making a difference in our public schools. CLICK HERE to view the Community Dashboard that provides real-time data on community agreed-upon metrics of education improvement. Beyond the traditional three Rs, the Mobile County Public School System has expanded its focus to three new ones—rigor, relevance and relationships. Every high school now offers Advanced Placement courses. Focused attention is being brought to ensure that more students are reading on grade level at the end of third grade—a leading early indicator of starting on track to graduation. Likewise, more students are taking the math courses they need to handle algebra in middle school, an indicator that students remain on track. To ensure every student in Mobile County graduates ready, we are raising the bar. For the first time, starting in the 2014-15 school year, every high school student will take the ACT college entrance exam—not just those who can afford it or those with stated plans to go to college. And, we are working to increase the average ACT score to 21, a nationally recognized indicator that a student is prepared for—and can persist through—college-level courses. Beyond K-12, new attention across Mobile County is being paid to ensuring universal access to pre-kindergarten and kindergarten for our youngest learners, ensuring that they start school ready to learn. The school district is also working to ensure postsecondary access to students moving forward—whether in structured training opportunities, two-year degrees in community college or associate programs, or four-year university degrees. As a result, high school graduation rates in Mobile County are on the rise. They are up nearly 20 percentage points in the past three years. The reason is a combination of focus and accountability. For students who are over-age and under-credited, we have established new credit recovery options. We have brought a laser-like focus to the issue, making sure that schools offer more rigor to everybody, not just some. 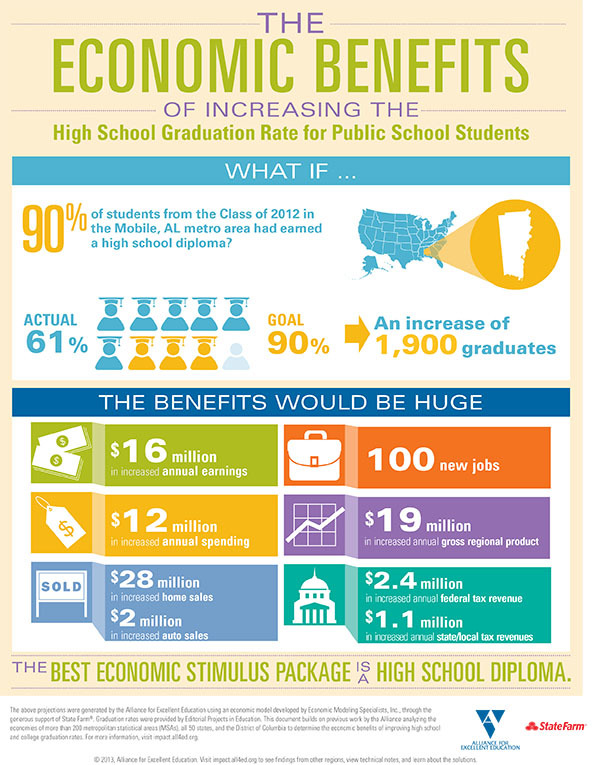 The best economic stimulus package in the Mobile region is increasing qualified high school graduates. Every high school in Mobile County is becoming a Career Academy—focused on the five key industry areas in the Mobile region: aerospace, advanced manufacturing, shipbuilding, health, and teaching and learning. Through partnerships with industry leaders—including internships, job shadowing and mentors—students are being prepared in rigorous academics, such as science, technology, math and engineering. They are also learning the 21st century skills (communications, collaboration, creativity and problem-solving) they will need to succeed in these industries. In 2001, Mobile County voters passed a historic tax referendum that put more money into our public schools than had been allocated in more than 40 years. In 2011, citizens refused to step back—they voted to sustain that increased funding. All the while, people came together from every sector of the community—folks from churches, businesses, nonprofit organizations; parents, educators, everyday citizens and taxpayers. Around kitchen tables, in coffee shops, churches and libraries, they talked about what they want for Mobile County and our schools. If they didn’t come out, we went to them. This broad-based citizen engagement is unique to the Mobile story. The collective citizen voice enabled us to raise expectations. And it has brought us all together on a path for continued success. Citizens agree that our quality of life depends on the region being business friendly, family friendly and safe. Citizens also know that improving our schools, and the quality of our graduates, can do a lot to improve other factors that contribute to the overall quality of life in Mobile County. By improving the quality and employability of our graduates, we increase their chances of higher annual earnings. That gives Mobile County the opportunity to broaden our tax base, which can lead to better parks, bike trails, recreation options, and improvements in the arts—all giving families more to enjoy near home. Those factors can, in turn, help to keep our middle class thriving in the region. And a better quality of life in Mobile can help to keep our young people from looking elsewhere when thinking of where to build their lives and families. All of that can help to increase our volunteer base and the number of people actively caring for and continuing to support our community.